Not so long ago, the composer Roger Briggs was inspired by the Montana poet Patricia Goedicke’s poem titled The People Gathering Together. His original composition, along with a few others, will be performed Sunday, April 3 at 3 pm in the Performing Arts Center (WWU). The concert is free to the public. Roger asked me to design a poster for the event, and I was happy to do that, and made a watercolor painting inspired by the poem and the idea of music. I received permission from the University of Massachusetts Press, which published Goedicke’s book Crossing the Same River in 1980, to create a broadside of her poem, which uses the artwork I made for the poster. The poetry broadsides will be available, in an archival edition, for purchase at the concert. The poem, like Roger’s music, is beautiful. 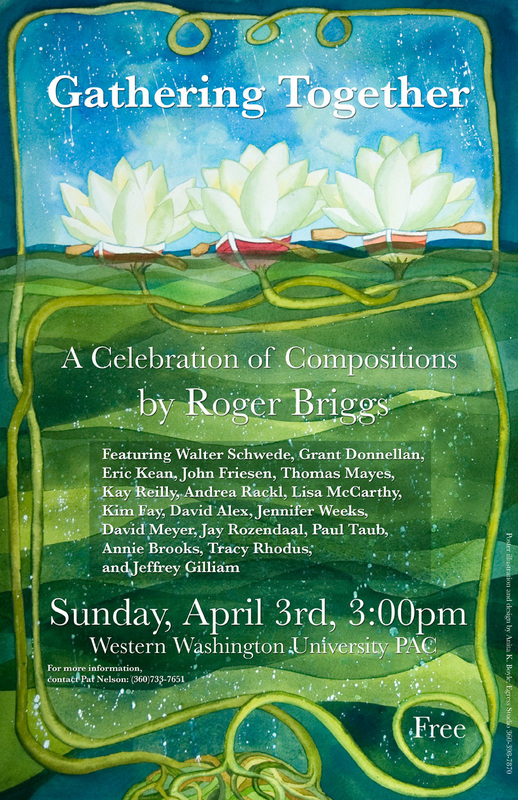 You can hear Roger’s work this Sunday, and the poem will be read there by my favorite poet: James Bertolino. I’ve copied the poem (below), which I hope you’ll read out loud. Take it slow. It sounds best that way. And then take another look at the poster (above) and ekphrasitcally imagine that the poem is on the poster instead of the other information. That’s what the broadside looks like. Foremost, if you intend to be anywhere near Bellingham this Sunday, I hope you’ll plan to take in this concert of remarkable music. Jim and I heard Alex Kuo read last night at the Anchor Art Space in Anacortes. His work is feistily enlightening. He is passionately contentious. He has great control over the twinkle in his eye. When it’s there, you can’t help but smile. When it’s not, you’d better look out. The reading included Kuo’s work from his latest poetry and fiction publications. The work that he read most often last night made his stand on American culture clearer to even the inattentive: this is a great place, but it could certainly be better. He’s right, and he didn’t even begin to talk about Jesuits. To begin the reading, Sherman Alexie gave a very touching introduction to Alex Kuo. I’m glad I was there to hear the introduction, and especially to hear Alex read and comment on his new work. Jasmine Valandani’s artwork was hanging on the stark white walls of the Anchor Art Space. Her work is whisper quiet. 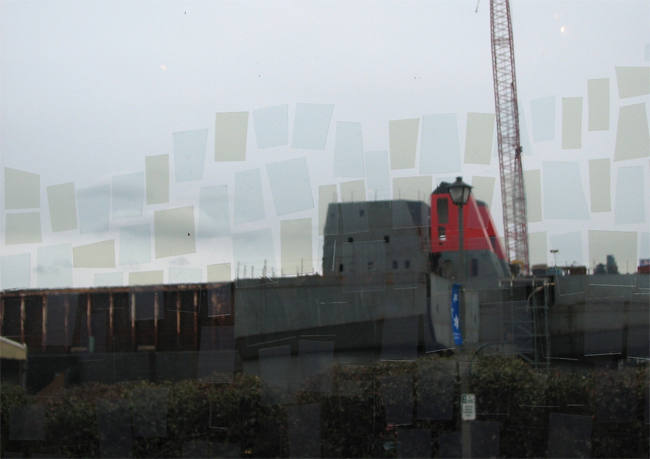 Often, you need to lean forward to see it, squint a little, turn your head sidewards and then move it back and forth. And there it is, Jasmine’s art. It presents itself to you slowly and lovingly. I would call it neo-susurrus, or the New Whisper. And it is delightful. All during the reading, there was a beautifully ethereal piece of music playing that complemented Jasmine’s art like it was made for it. Well, it was. Steve Peters is a composer who works with sound. We listened to his piece last night during the reading, and it was a wonderful backdrop. There was an intentional sound that permeated the gallery at a low level, not intrusive, but definitely present—the musical equivalent of Jasmine’s artwork. Jasmine Valandani and Steve Peters have planned to talk about their work at the Anchor Art Space Sunday, March 27th, 1- 4 PM. I’ll be at the Whatcom Symphony Orchestra concert, but I sure wish I could be at the Anchor at the same time. Jasmine Valandani will discuss her work in the current exhibit in relation to process, materials and intention. Composer/sound artist Steve Peters will give a talk on his current sound installation at Anchor, “Chamber Music 9: Northern Light”. The piece was made to accompany the current visual show by Jasmine Valandani and is based on a one-hour recording of the empty gallery, and references the mysterious phenomenon of “auroral sound” associated with the Northern Lights. In addition to discussing the work itself, Steve will also discuss the act of intentional listening, and will guide guests on a silent listening walk through the neighborhood, weather permitting. Membership Art Show at Allied Arts Gallery during March. Here’s a watercolor and gouache painting of mine titled “Homage to Fish & Chips with Beer,” which is inspired by Morris Graves’ painting titled “Minnow,” one of his best-known works. 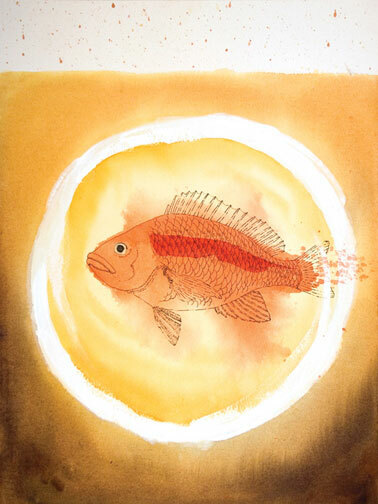 The fish in my painting is a hardly a minnow, and makes me hungry. Last summer there was a celebration in Seattle of Morris Graves’ life (who died in 2001). Graves was known as one of the Mystic Painters of the Northwest. The red snapper in my painting is currently showing at Allied Arts Gallery in downtown Bellingham as part of the membership exhibition. This show is fun to walk around and see what everyone has been up to. You’ll probably find your favorite artists there. 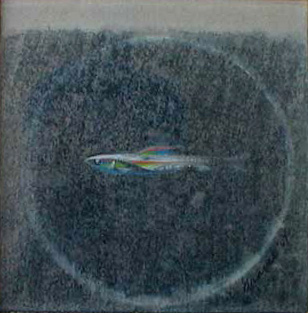 Check out the fish painting by George Jartos while you’re there.